Various Network Elements e.g. overhead lines or transformers are prepared as templates and can be used very easy to design electrical 3-phase and 1-phase power networks. All network elements are defined from the electrical engineering point of view. The knowledge of the geometrical and physical data of the network elements are sufficient to define the required settings. Internal, only ATP related settings are predefined and invisible for the ATPDesigner user. 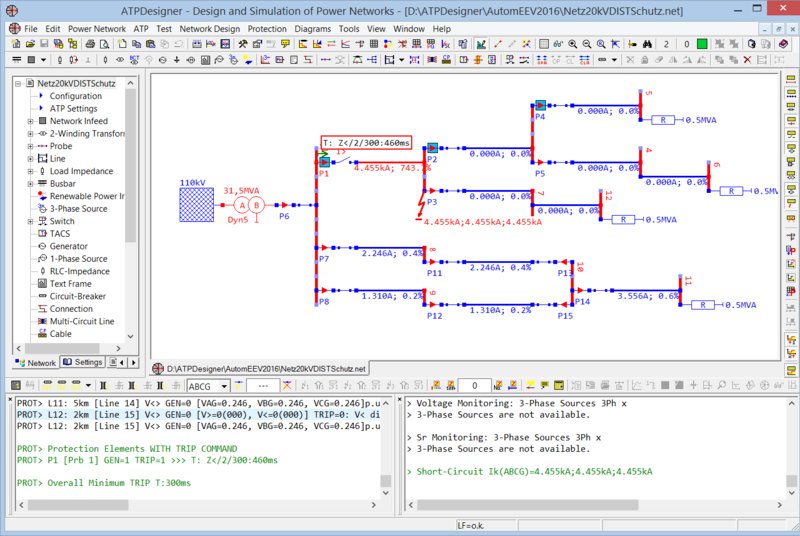 Neither detailed knowledge in modeling power network elements nor detailed knowledge about ATP and the ATP rules are required, if ATPDesigner will be used as the graphical user interface. 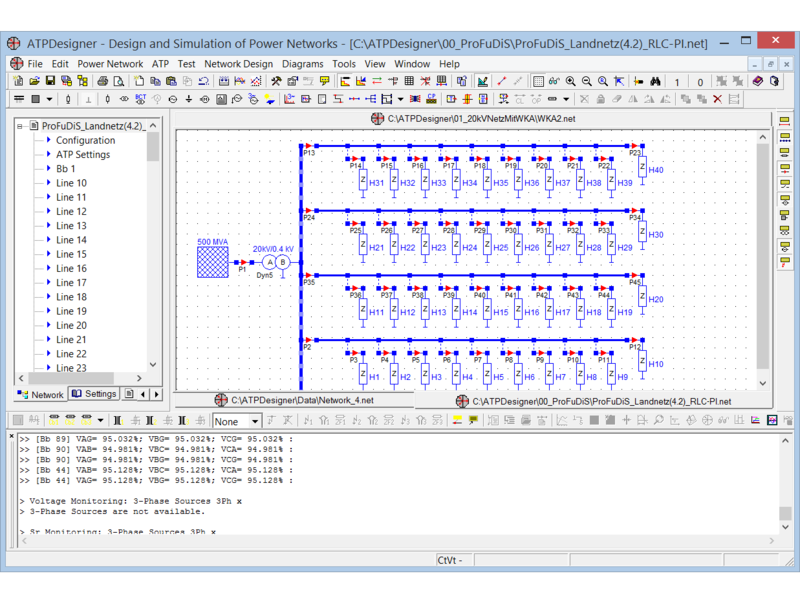 ATPDesigner includes also a Diagram Viewer to present the calculated voltages and currents as a signal diagram. .PL4 - Files as well as COMTRADE - Files can be read and presented as a diagram. 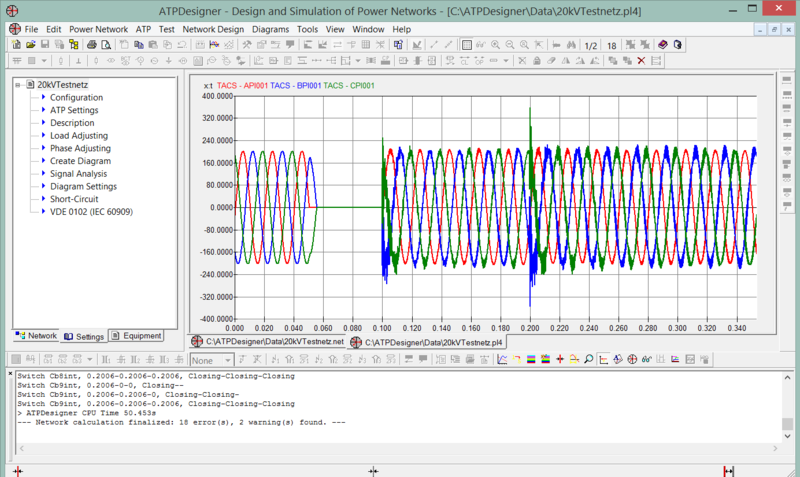 Based on the diagram viewer extended Signal Analysis capabilities are implemented based on the DFT-Algorithm. The results will be presented as a List of the Calculated Complex Vectors or as a Vector Diagram. ATPDesigner is designed to read and process COMTRADE files, which are defined according the international standard IEC 60255-24. ATPDesigner reads the COMTRADE .CFG - and .DAT - files and verifies the content of the files regarding the international standard. If possible ATPDesigner accepts deviations from the COMTRADE standard as much as possible. Therefore it is very important to read all messages which will be displayed from ATPDesigner reading the COMTRADE files. ATPDesigner has also extended capabilities to support the user analyzing faults and disturbances in electrical power networks. Therefore ATPDesigner has been prepared to calculate new, user defined equations processing the analogue and binary signals of COMTRADE files. Please note, that ATPDesigner supports the definition of User Defined Equations only based on the COMTRADE file import function. A lot of different functions are available to calculate new, user specific output signals. Both mathematical equations e.g. subtraction or addition and filter algorithms e.g. DFT (Discrete Fourier Transformation) algorithms can be used easily to combine available input signals. Not only the design and the analysis of the transient behavior of power networks in case of network faults but also the analysis of the stationary behavior of electrical power networks is supported. 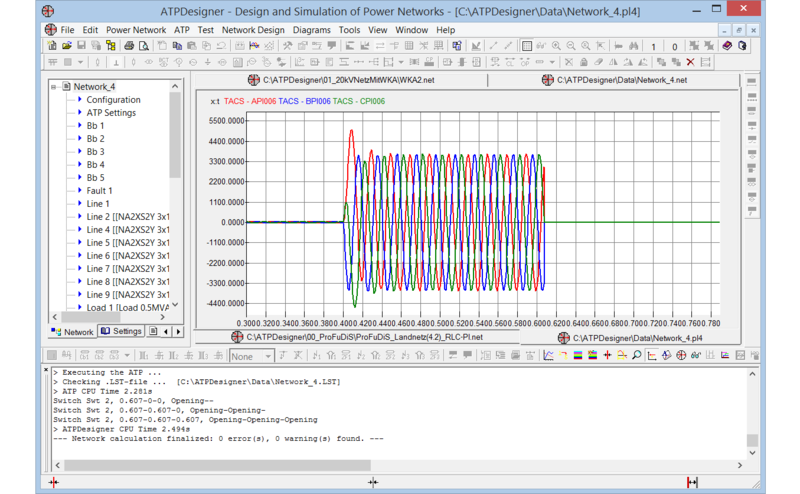 Short Circuit Analysis or Load Flow Analysis of power networks are also implemented as part of ATPDesigner capabilities.